Used for production pork splitting (up to 400 hogs / hour / saw). 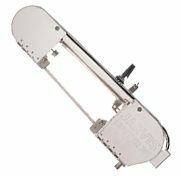 Internal sanitization system for primary contact areas – including guides, front and rear wheels and blade. Adjustable front wheel alignment for better blade life. Drive system is oil bath lubricated for sustained trouble-free operation. Meets national and international requirements for hygiene and safety (USDA & CE approved).